The Christmas Holiday period is a terrible time to take off somewhere because not only is it the Holiday period, but it is also the summer holidays. So the traffic on the roads is bad and all accommodation is triple the price of later in the summer. We had friends come up from Sydney for lunch yesterday and it took them over an hour to get out of Sydney, instead of about 20 minutes. So the cricket test match is on upstairs with the Dearly Beloved (DB) glued to it and I am downstairs happily sewing. 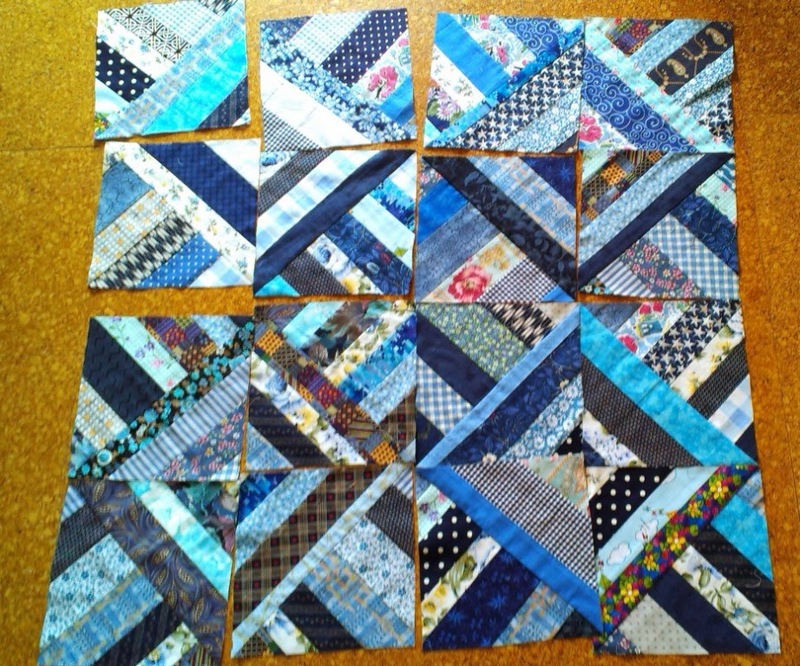 In the past couple of days I have finished the Orphan Block quilt top, and pieced its backing. It is now ready to go to Cabarita for pinning. I am really pleased with the result. While I was doing that, I had a thought. 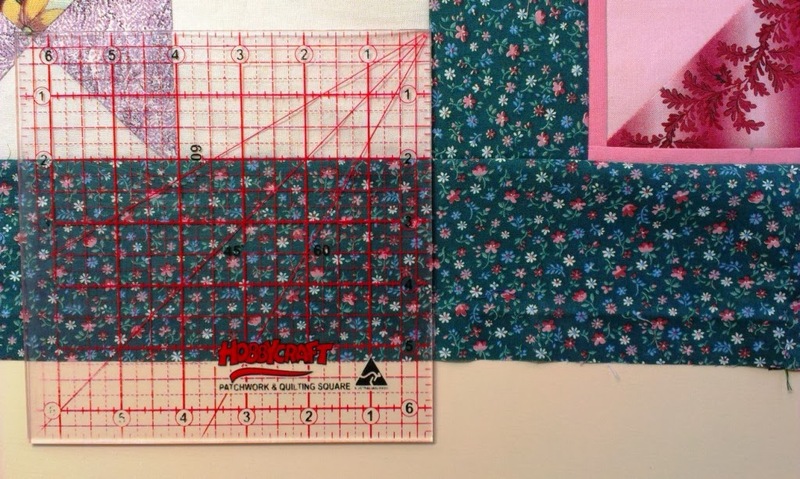 Does anyone have trouble lining up blocks that have been sashed? 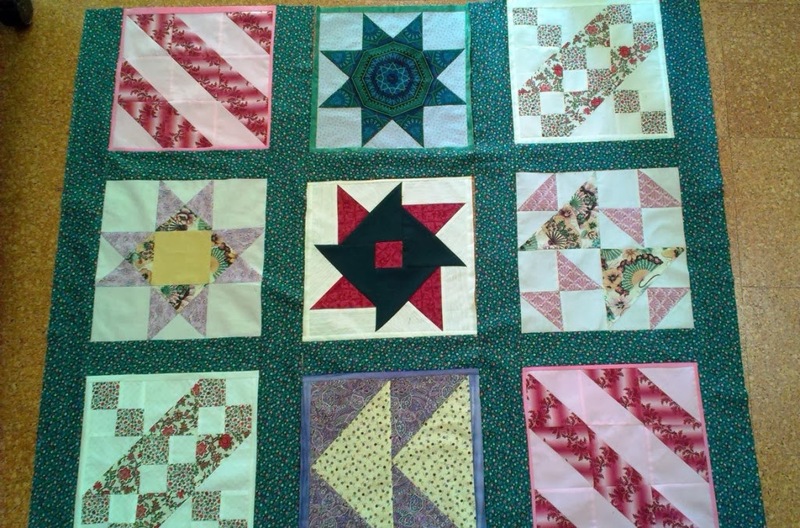 I have been quilting for years, but it is only this year that a friend of mine showed me how to do it so that the rows line up perfectly every time (thank you Raelene!!). I thought I would show you how I do it. 1. Piece all the blocks into rows with the vertical sashing between them. You are now ready to put on the horizontal sashing. 2. 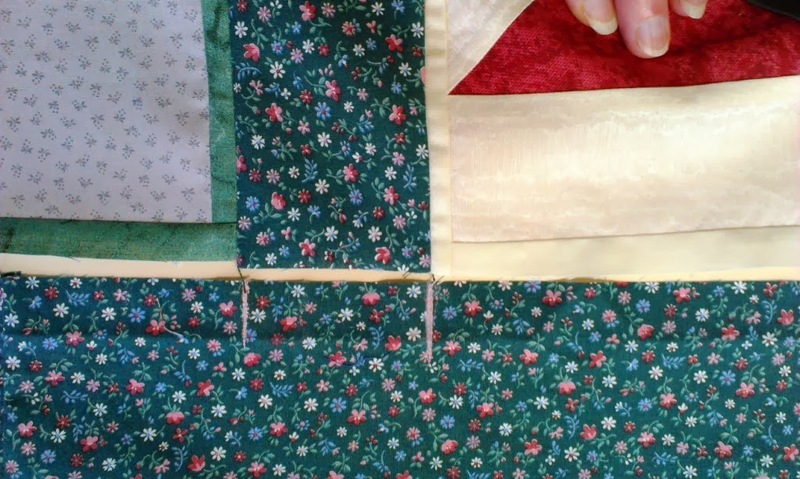 Measure the length of sashing you need, and sew it to the first row of blocks. Iron the sashing. I usually iron the fabric towards the sashing to keep the bulk of the seam from the pieced block. 3. Line up your ruler with the edge along the length of the block and extending to the other side of the sashing. You will see that I also have the 2" mark on the ruler aligned with the bottom of the block. Mark the edge of the sashing with a pencil. Continue along the length of the sashing piece, marking each block edge. 4. Match up the sewn seam line (not the edge of the block) of the row below with the marks you have made, and sew. Apologies, but the photo is actually upside down. Voila! Perfectly matched corners on the rows of blocks. 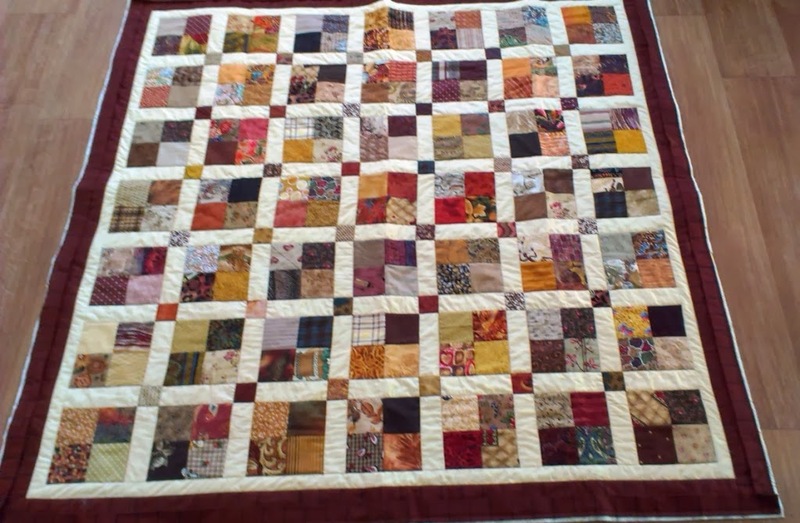 I also finished quilting the Brown scrappy quilt I started last month (I told you all about that here and here). Must be a record for me! 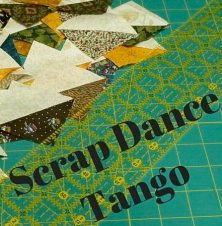 LOL I have put some binding on it, but will take it to Cabarita for someone else to hand sew that down. There are a couple of ladies there who love doing that, so more power to them I reckon. Madam decided that it was the perfect spot for a snooze and made a beeline for it as soon as I walked away from it. I cast around what to tackle next and found a bunch of blocks I had made back in March. 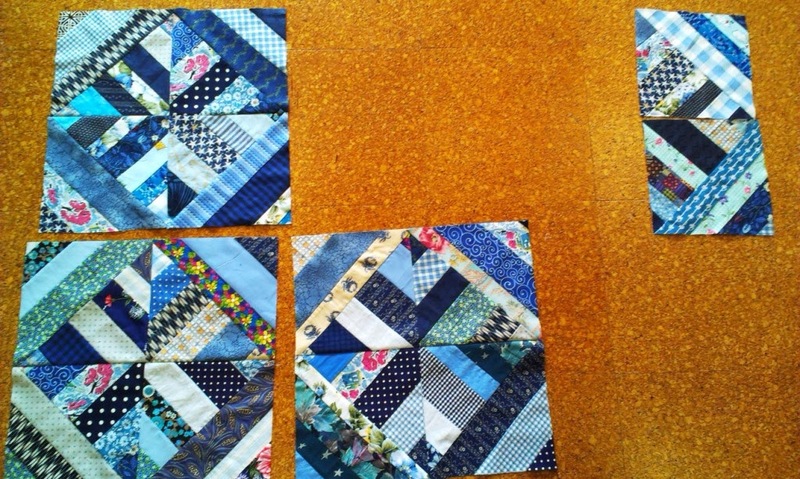 When I sorted it all out I found that I had enough blocks made for a single bed quilt and also a lap sized one. Here is the smaller one laid out on my floor this morning. And the partially pieced single quilt. This type of block makes a secondary design of noughts and crosses when you lay it out. I chose to do the lap one with the noughts and the single with the crosses. I don't know what was going through my head as I was making these because there are actually 23 blocks. This just is not possible, because the method of construction I use always gives you blocks in sets of 4. It is dead easy. If you would like me to do a tute on how these are made, just leave me a comment (or send me an email for those following by email). I then began to construct some sashing pieces, and this is as far as I got this evening. Time to go get the DB his dinner. 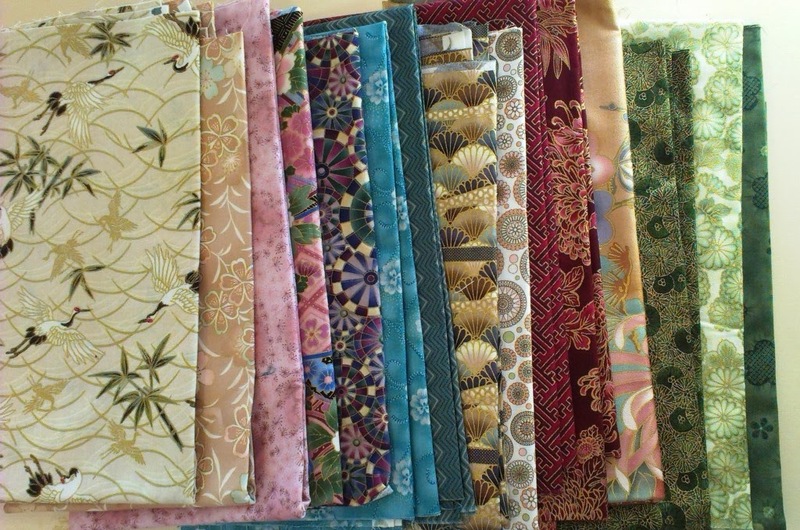 I am planning to make some corner stones in the reverse of the fabrics I used in the sashing. Hope you are enjoying the holiday break as much as I am. Edited: I have joined the Show Off Saturday linky party. Why not pop over and take a peek at some of the other great things people have been doing. Til next time..... Keep on stitching. 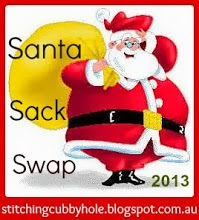 In my last post I blogged about all the things I made for my swap buddy Lynda for the Santa Sack Swap. So now I will show you what the lovely lady sent me. I managed to restrain myself from opening any of the gifts until Christmas Day. This is what it looked like after I had ripped all the paper off! First there was a block roll for laying out, storing and transporting blocks while they are being pieced. 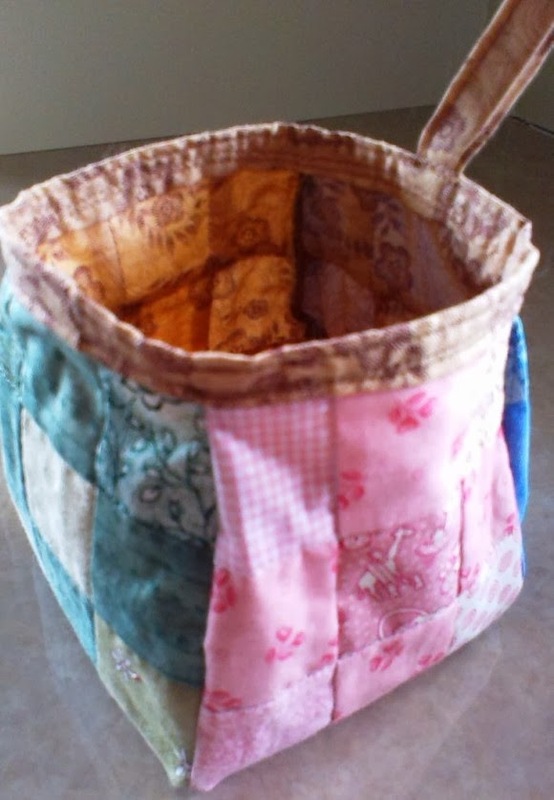 It is made of plastic backed fabric and has flannel on the interior so the pieces won't flop off. It is quite large when unrolled too, so I should be able to stack a couple of 12" blocks on it easily. Brilliant! I actually use a plastic backed tablecloth which is lined with flannel as a design board and it works a treat, so this should be perfect. 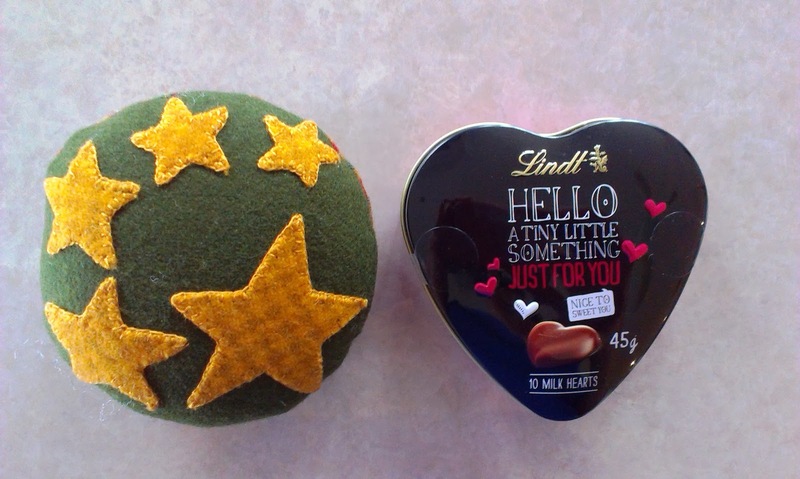 A pin cushion made out of woollen fabrics in country colours and a box of Lindt chocolate hearts. How did Lynda guess that Lindt Milk Chocolate is my all time fave? A little pouch in the prettiest pink florals. This little guy has a zippered pocket, one large and two smaller slide in pockets, and is embellished with a tiny little sewing machine. When I first saw this little pouch rolled up I thought it was a jewellery travel bag. 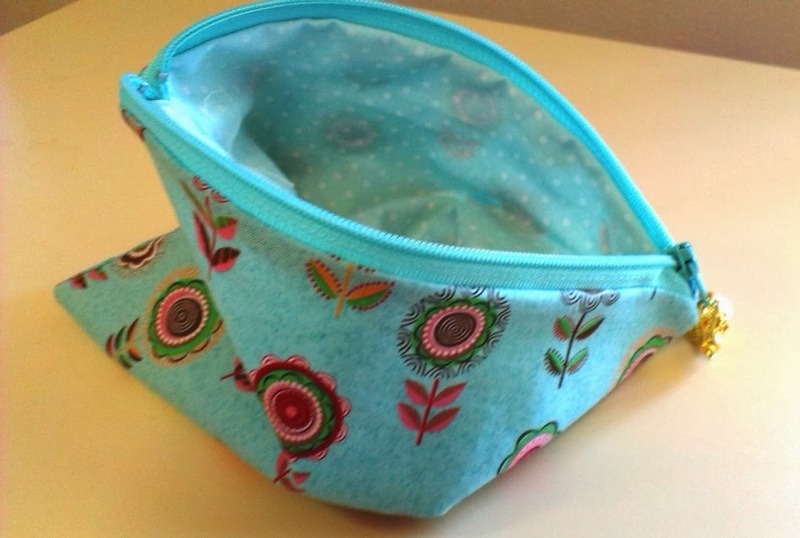 But the sewing machine embellishment makes me think it is intended as a sewing tote. 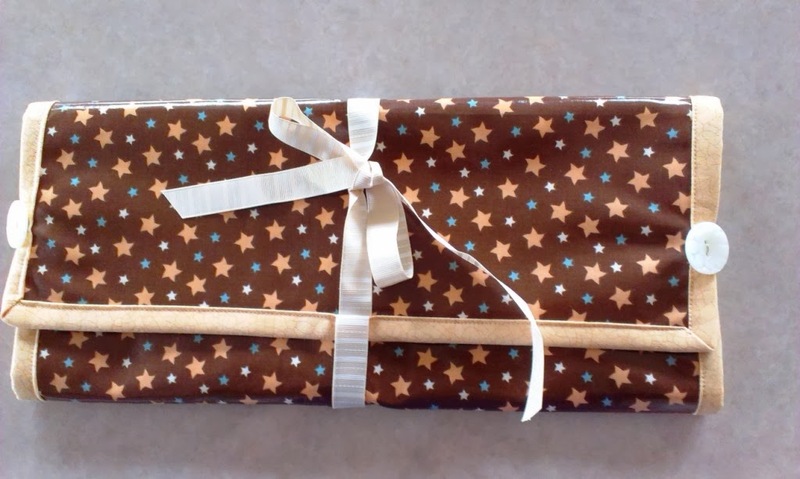 I might still use it as a jewellery roll as I travel a bit and could do with one of those, and this will be perfect for that. Do you mind Lynda? 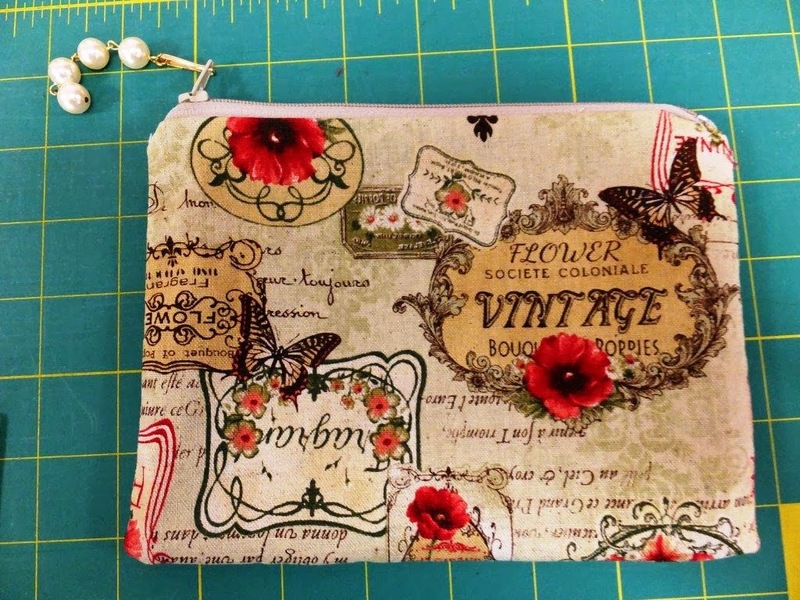 Whatever I use it for, I think this is so pretty, and it is beautifully made. Next up was for me the piece de resistance. 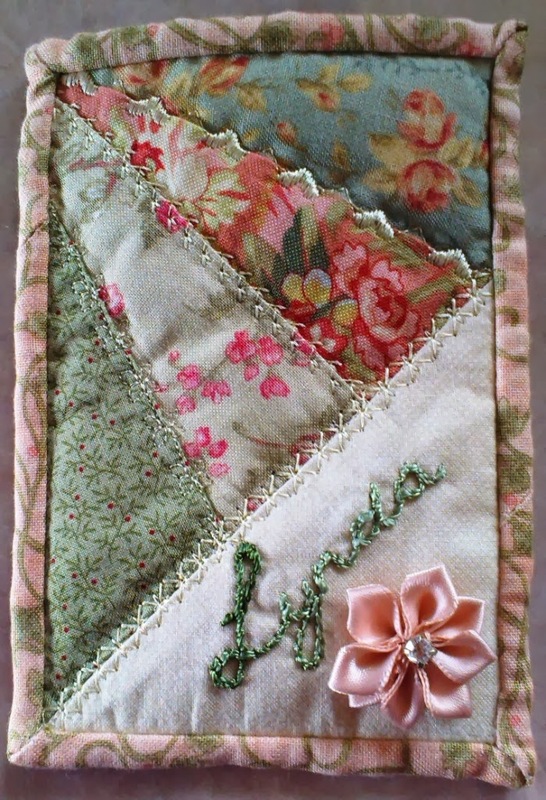 A lovely table runner. Love it, love it, love it! Love the elongated hexie shape and the colours too. 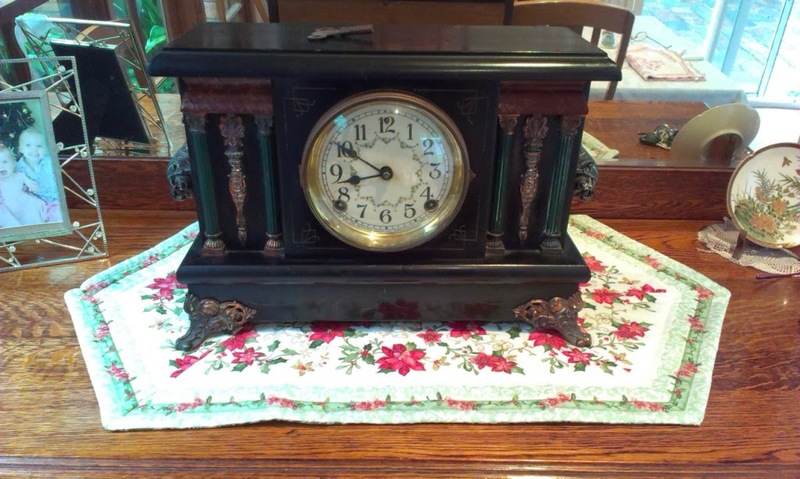 It has gone straight to my side board in pride of place under my antique Sessions clock in the family room. Doesn't it look super there? The side board has a mirror at the back and I had to work very hard not to get my reflection in the photo! 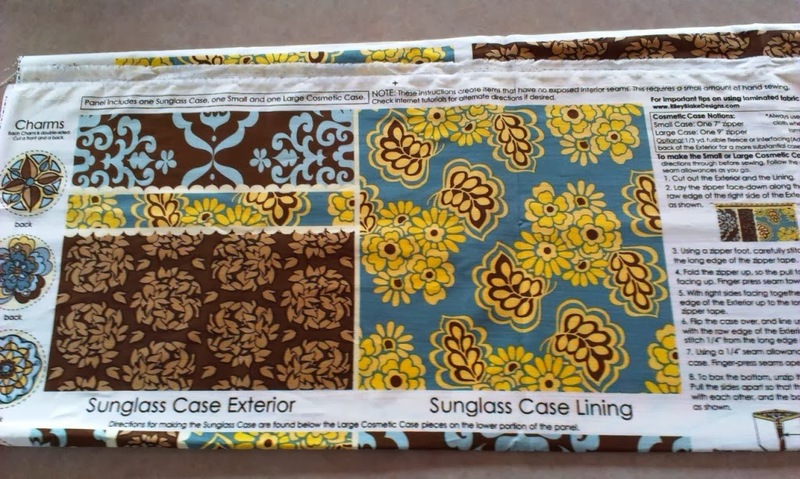 And last, but not least, a printed panel with instructions for making a sunglass case, and a large and small cosmetic purse. I will have fun with those I am sure. I consider myself lucky to have had such a nice partner this year. It is so much a luck of the draw who you are partnered with, and there is always the chance you won't like the gifts. Not me! Thank you Lynda for the lovely gifts. Hope we keep in touch and maybe meet up one day soon. Earlier this year I joined the Santa Sack Swap run by Cheryll. If you are interested in what the swappers got up to, there is a linky party going on at the moment here. My lovely partner was Lynda. This wasn't a secret swap, so we communicated via email, and had several chats throughout the time the swap was on. The swap was 6 gifts, one of which had to be Christmas themed and hand made, plus a bag/tote/stocking in which to put it all. I can now show you what I made for her, as Christmas has been and gone. The first gift I made was a name tag. I trawled the web for an idea but in the end came up with my own design. I began by doing the embroidered name. 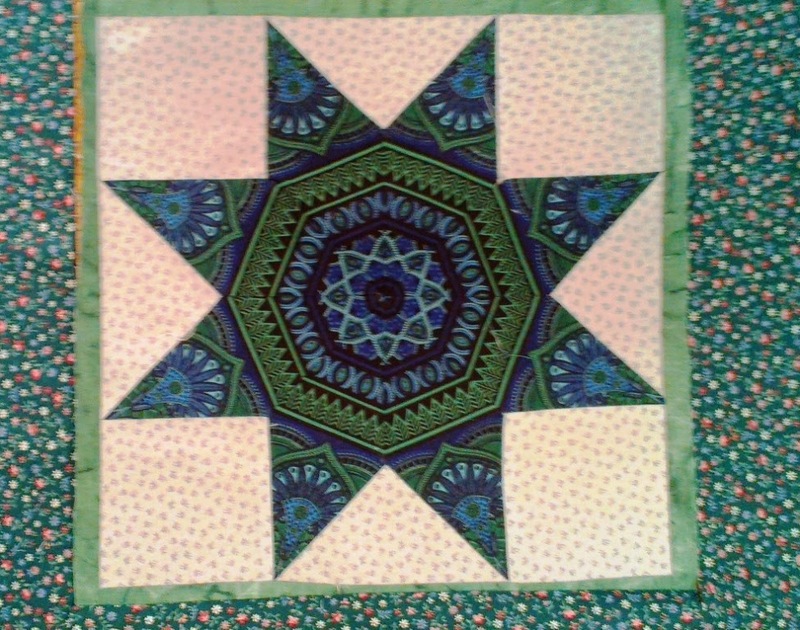 It was then foundation pieced and after I had constructed it, I used some of the pretty stitches my machine does to quilt it. For gift No. 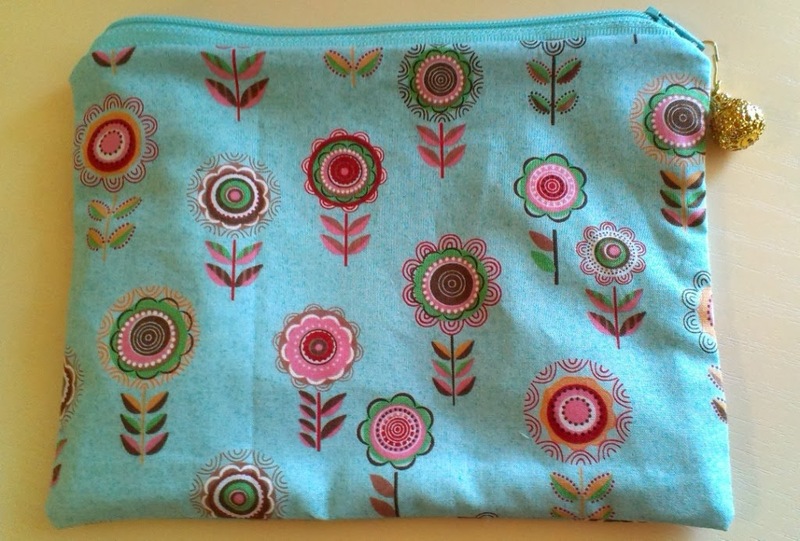 2 I found a lovely zippered pouch tutorial at the Renegade Seamstress and decided to use some lovely linen I had bought at the Hunters and Collectors Barn in Coffs Harbour on a recent trip. This was a super tutorial! 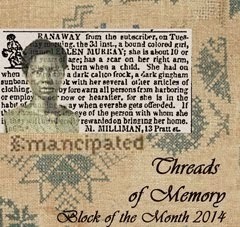 Aren't we just so lucky to have generous quilters put their ideas up on the Net for us? 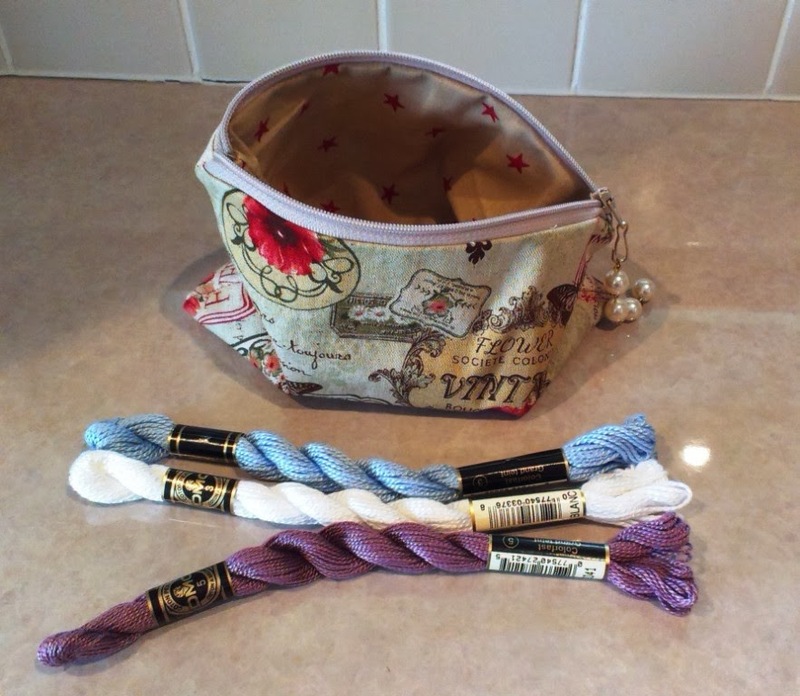 I popped a few skeins of DMC perle embroidery thread into it, as I saw on Lynda's blog that she enjoys embroidery. Hope she finds that useful. Next I found a great idea on Ella and Nesta's blog here for a skinny pin cushion which they made for the Across the Pond Sew Along which is a Flickr group here. 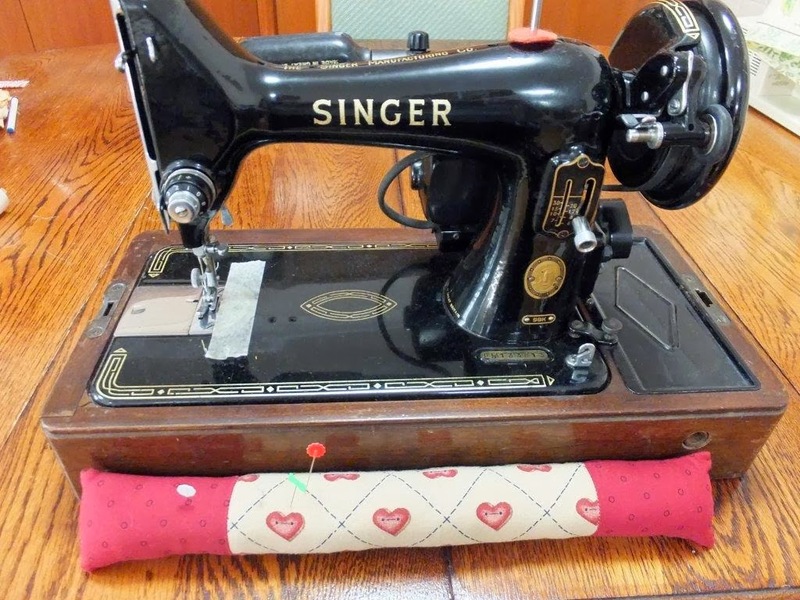 The idea is that the pin cushion fits along the front of your machine for your pins. I used some scraps of cute heart button fabric I've had in my stash for ages. Here it is in front of my Singer 99k (gift last year for Christmas from my gorgeous daughter). I added a box of flower head pins to that gift. My next gift was a dilemma. I had a mug bag made for that (not showing you in case I use it for the swap next year) with a mug to go with it. 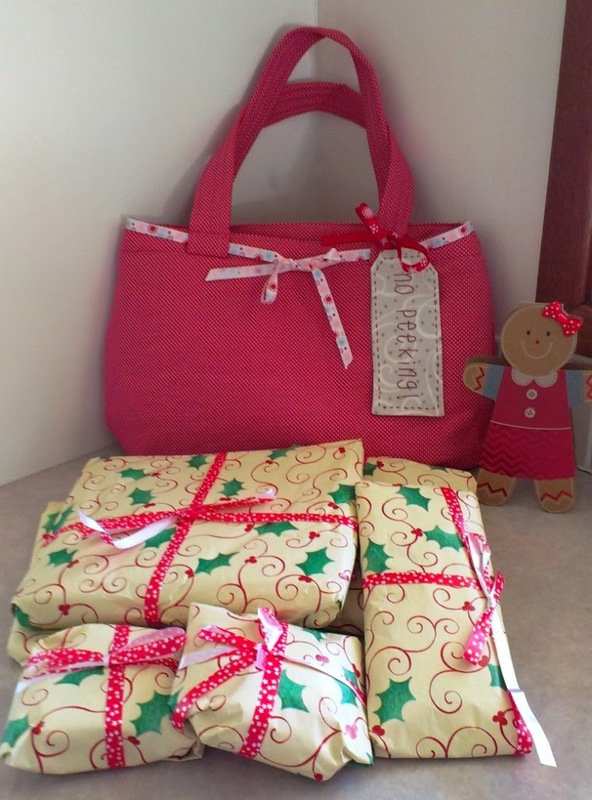 BUT at the eleventh hour Lynda posted a blog about a gift she had received as a Secret Santa gift. This gift was a mug bag, mug and tea. Oh woe! 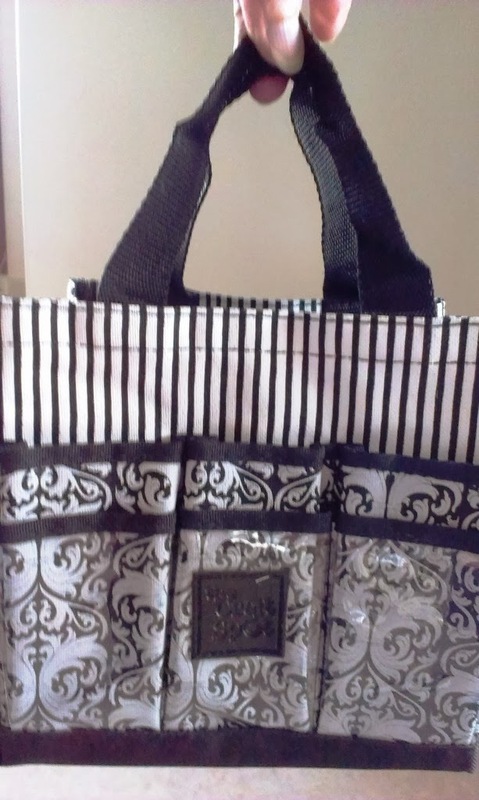 I had no time left to create anything else, so this little craft bag was the replacement. 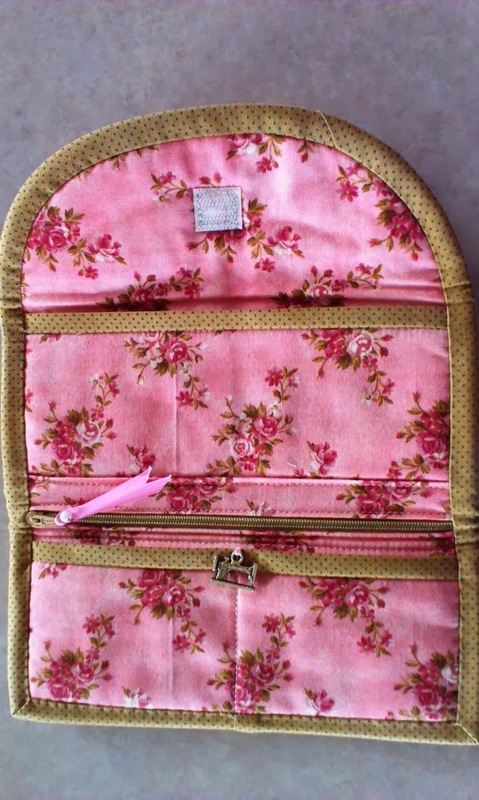 It has loads of pockets and spaces for different crafty things that we all have. 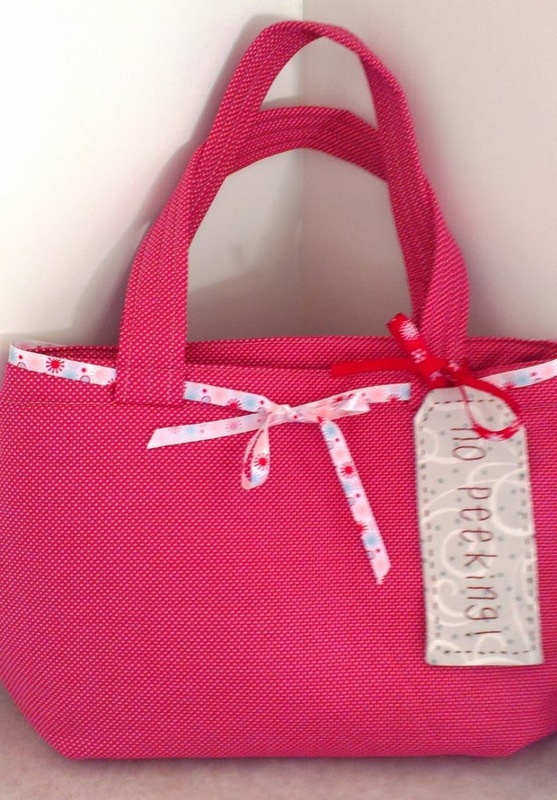 And the carry handles make it easy to transport all those bits & pieces to classes and group meets. The next gift was an Ort Bag from a pattern by Catherine McMurray I cut from a magazine a long time ago (possibly Handmade Vol 28 No 10). So what is an ort? An ort is an off cut of thread. 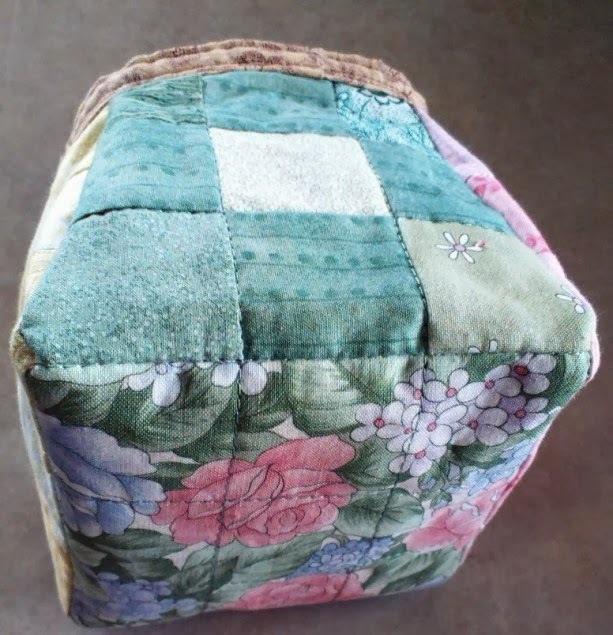 This one had 9-patch blocks on each side & bottom and was quilted in the ditch. The pattern was quite complicated to put together, and I really could not see how to simplify it. 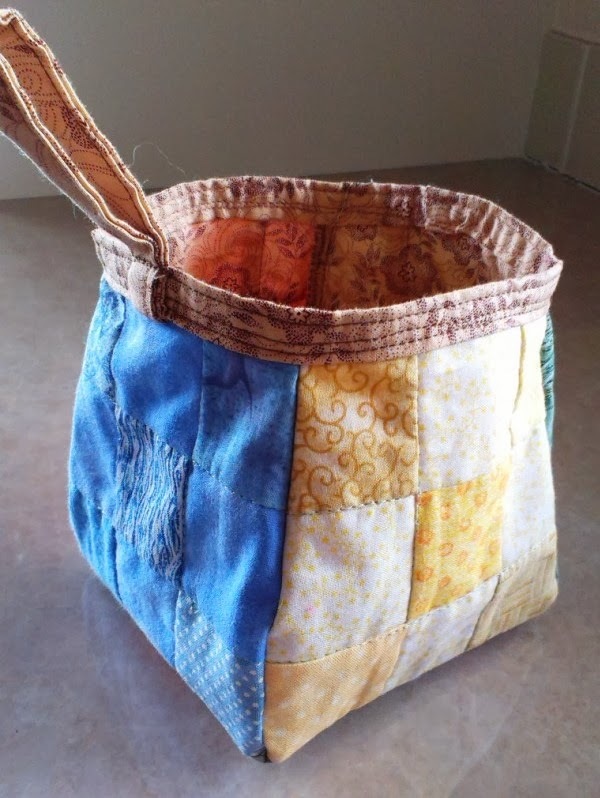 The problem being that you could only quilt it before you constructed the bag. Next was the Christmas themed gift. 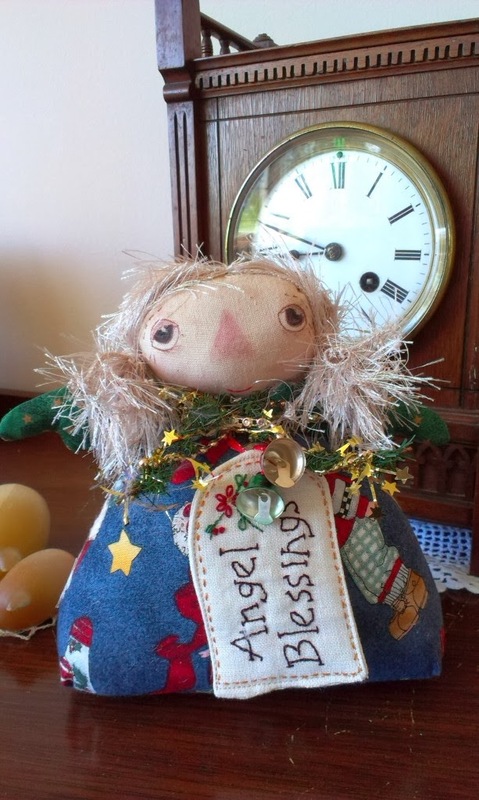 For this I used a Country Keepsakes pattern by Annie Smith called Angel Greetings. I bought the pattern at the Home Patch in Bathurst several years ago, so this was a great opportunity to use the pattern. That would have to be my all time favourite store. Shame it is just sooo far away! (boo hoo) Just loved making this, and so pleased with the eyes I painted on. I don't paint fabrics usually (don't ever paint anything actually), so I borrowed some Inktense pencils from my friend Di to do the job. I used tea died calico for the face, and scraps of Christmas fabrics from stash. A scrap of wool for some hectic hair and some bells & tinsel for decoration. I had spoken to Lynda about whether she would like a stocking, a tote or a bag. 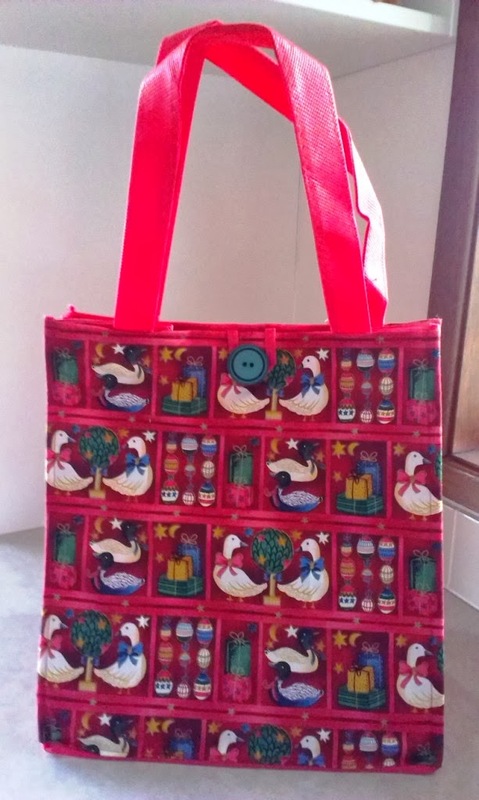 She had no preferences, so this is a regular shopping bag which I covered in Christmas fabrics. 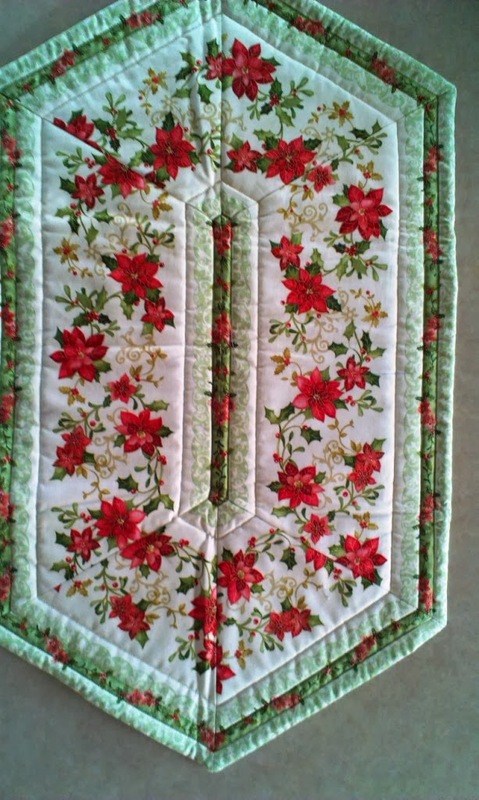 This one was for my Friday Quilters ﻿Christmas gift. We just placed all our gifts into a basket which was then passed around the table - you just dipped in making sure you didn't take your own. Elaine picked it, and I couldn't think of a more perfect recipient as she just loves Japanese fabrics. I am tickled pink she got it. I've shown you what I made for the kids in a previous posts here and here. Those goodies went down a treat, so I am pleased. I have had a peaceful day downstairs in my sewing room. I have done all the preparation for Christmas and keep having minor heart attacks thinking that I just must have forgotten something! I can't possibly be this organised so far in advanced of the big day. There are still the perishables to get in, but I can't do that yet. I finished stitching all the Christmas gifts I plan to make the other day. I have already shown you the school uniform I made for my youngest grand daughter's doll (here). I am so utterly chuffed with that! The main present she will be getting is a suitcase of her very own. 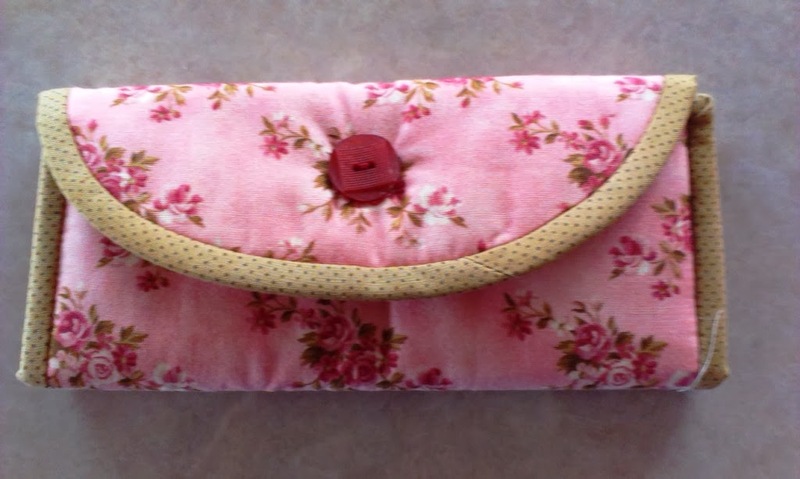 I used a free on-line tutorial by the Renegade Seamstress. It just comes together so easily, and so quickly, I can see myself making a whole lot more of these in the months to come. I have some lurid nail polish and some emery boards to pop into it. Should be just right for a 10 year old. The big gift is an ipod docking station. Missy 12 is going to get an Akubra hat as she is loving her classes in agriculture this year. As it needs to be tried on, there will be an excursion down to Sydney involved after Christmas. In the meantime, I've made her this little bloke. Hopefully she won't consider herself too mature to have something like this. Isn't he just too cute?? I had so much fun making him. I used a free pattern from Sew Mama Sew. Aren't we lucky that all these lovely people are generous enough to upload freebie patterns and tutorials? 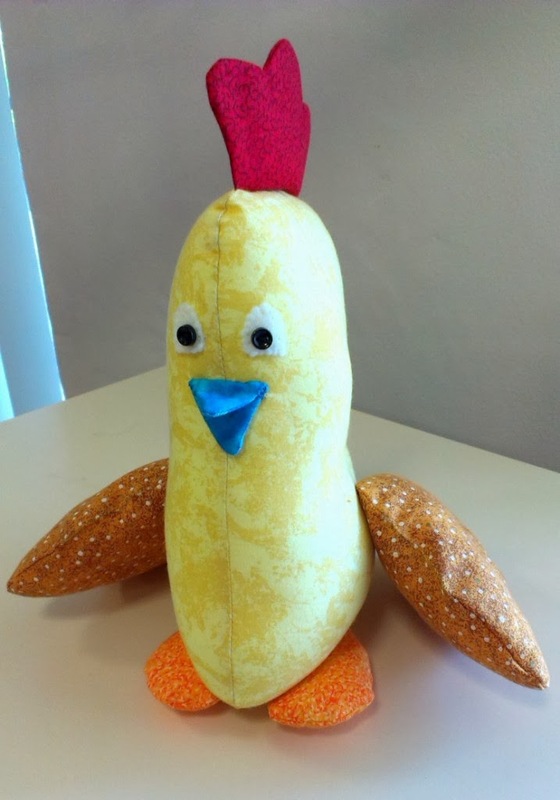 If you decide to use the pattern, I suggest you sew the eyes, and wings on before you stuff the body. Or alternately you could use a curved needle to do that. 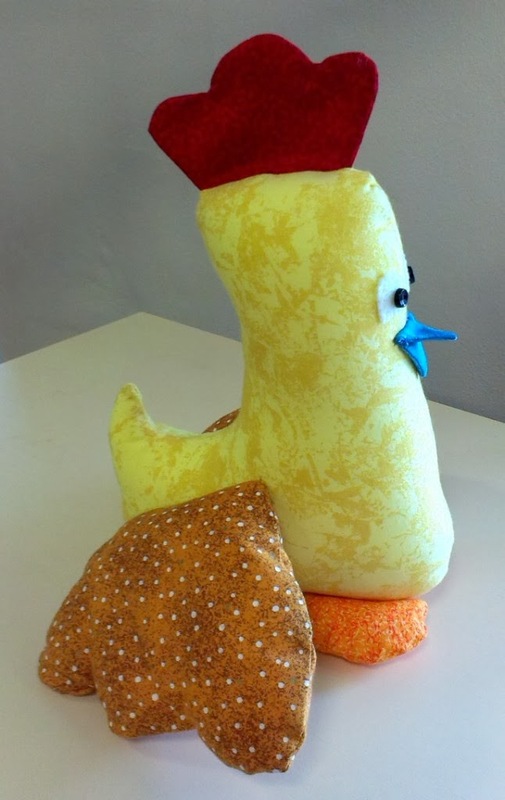 The toy was easy to make, but adding the accessories after stuffing the body was a bit of a trial. So yesterday evening I was casting around for something to sew, and dragged out a pile of orphan blocks. These were all donations to Stitching Hearts and I have acquired them, as there isn't anyone else who would be bothered to do anything with them. They varied in size from 12" x 12" right up to 13" x 13", with some blocks having a variation in size from one side to another. 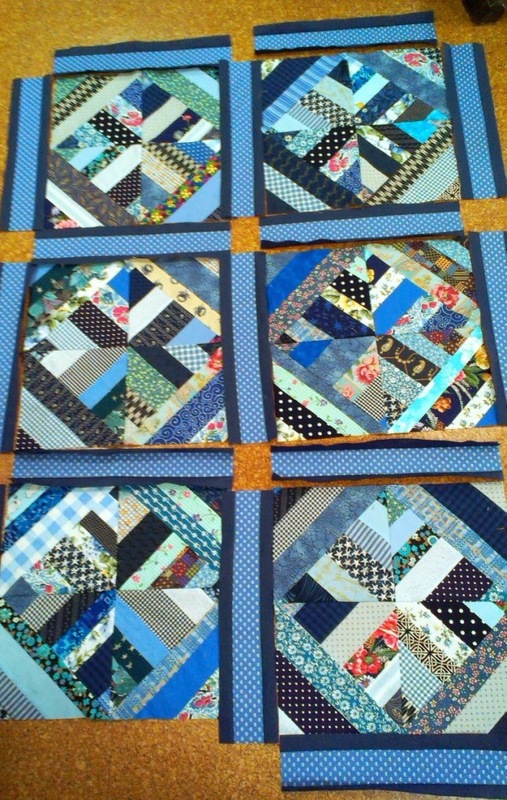 I had two choices - chop all the blocks down to 12" square, or build them all up to 13" with borders. I chose to do the latter because to cut the largest ones down would have completely destroyed the patterns. Almost all of them have points which disappear and some have bias edges which stretched. It was a bit of a pain! This would have to be my favourite block. Beautiful fabric and the fussy cutting has created a terrific pattern. The other one I rather like is this Jacob's Ladder block - there were two of those, and they were the smallest. 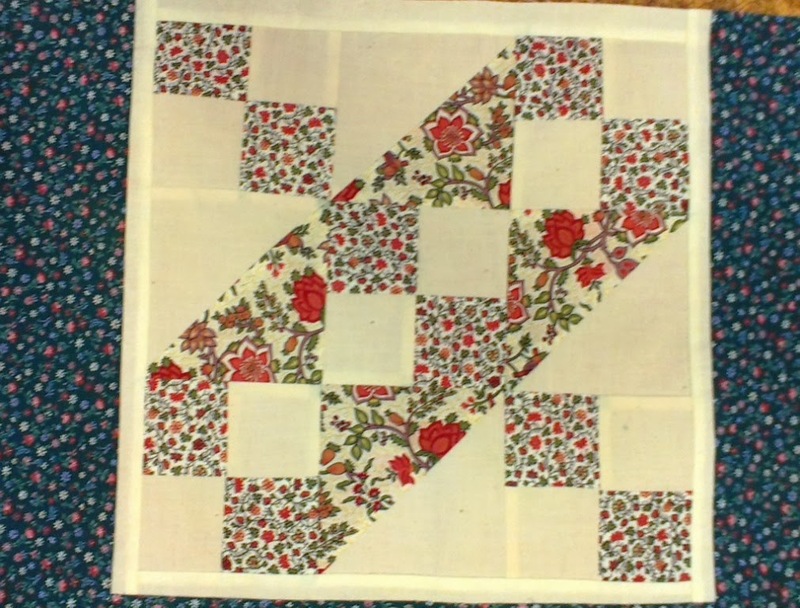 I chose to use an old fashioned fabric with tiny flowers on it for the sashing as most of the blocks were constructed out of quite old fashioned fabrics. All that is left to do is piece the centre row of blocks to the top and bottom and put the side sashing on, and the top is done. Doesn't look too shabby does it? I love doing this sort of thing actually, which is just as well, as there is a pile of orphans in my cupboard waiting to be built into tops. As I work with the blocks I wonder who made them. What was the story behind their construction. Did the makers tire of them or were they test pieces. I don't even really know when they arrived at Stitching Hearts, they were just there and I have picked them up as and when I saw them, so they don't come from the same source. Whatever. 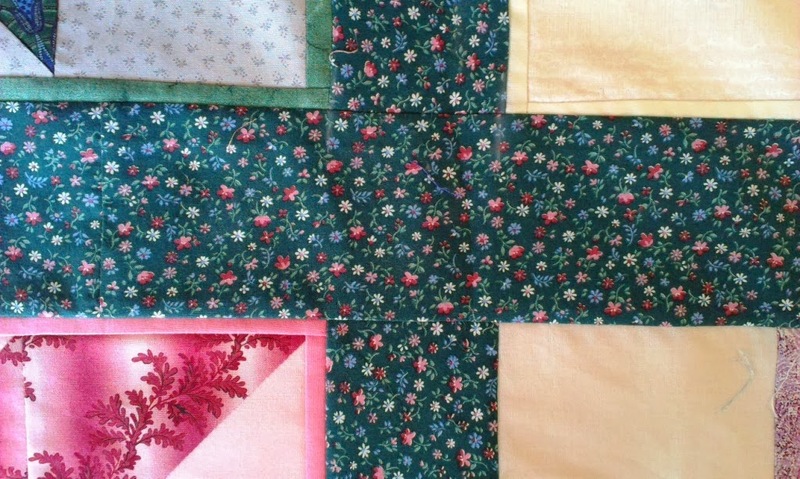 It is good to see this little lap quilt almost complete, and the fabric not wasted. It was present opening day yesterday for the Santa Sack Swap I participated in this year, but I have chosen to leave the gifts I received until Christmas Day to open. 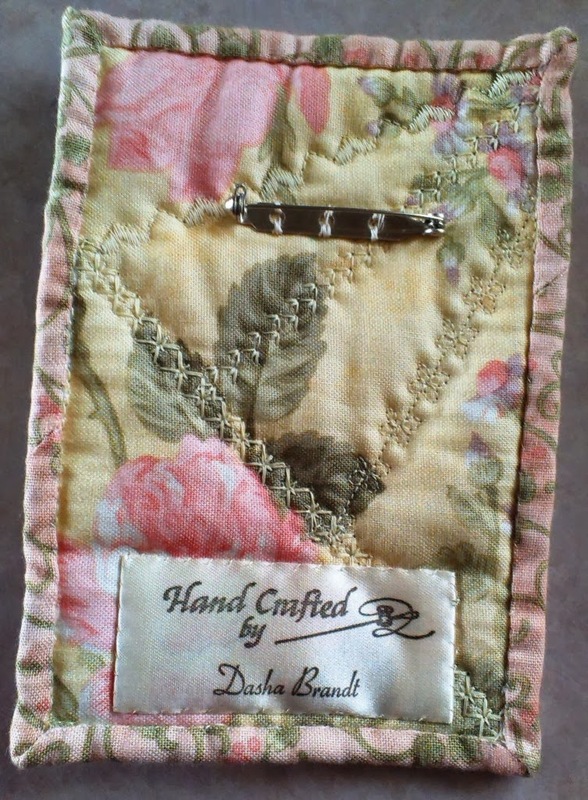 When I see my swap buddy, Lynda, blog about her gifts, I will be able to reveal what I made for her. It has been terribly hot today. 37.7C with a hot wind in our front garden at 5pm. Admittedly that is the part of the garden which gets the most sun. The forecast is for a bit cooler tomorrow, then very hot days again on Sunday & Monday with a change & rain on Tuesday. I have come upstairs to sit in the cool of the aircon to do this. But now I have to go cook some dinner for his nibs. Wot? You say? Two, yes two posts in the same day?? Unheard of. I wanted to share a couple of things. Meet Millie. 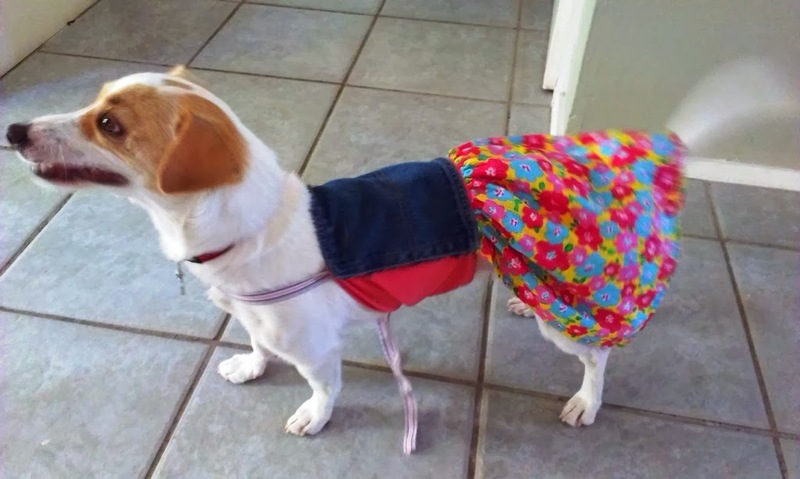 She has been in my daughter's family now for about 4 months, and she is a sweet little dog. I failed miserably in getting a good photo, because she is in perpetual movement - see that tail? She was a rescue dog and is blissfully happy with the attention she gets from 3 girls. 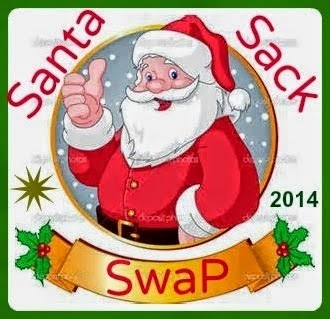 Tomorrow is opening day for the Santa Swap. Can't wait! I'll be able to show you the goodies that have been beckoning me from under the tree for the last week. Barbara at Cat Patches is an enabler extraodinaire. 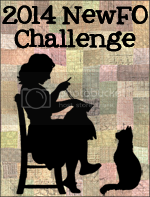 She is hosting the New FO Challenge for 2014. If you are asking what is a New FO, it is starting a new project with no requirement that you finish it ever! Sounds like I am going to like that one LOL. The link to the linky party is here. 1. A quilt for Chelsea from my lovely Japanese fabric stash which has been languishing in my cupboard for upwards of 2 years waiting to be attacked. I look at them occasionally and stroke them fondly, but have never got past that. 2. 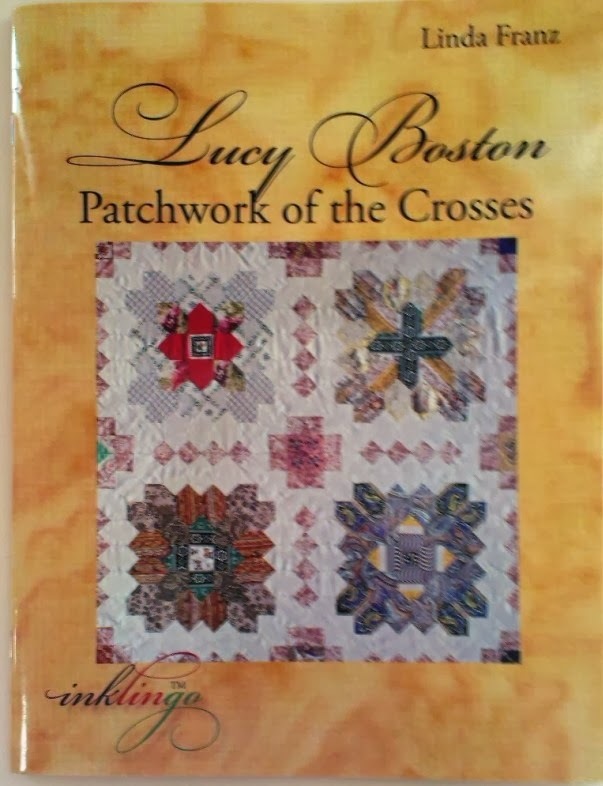 Lucy Boston's Patchwork of the Crosses. If you are inspired to try it too, the book is available here. There is a whole Pinterest Board devoted to these blocks just to get you drooling. 3. A quilt for my Dearly Beloved (DB) . 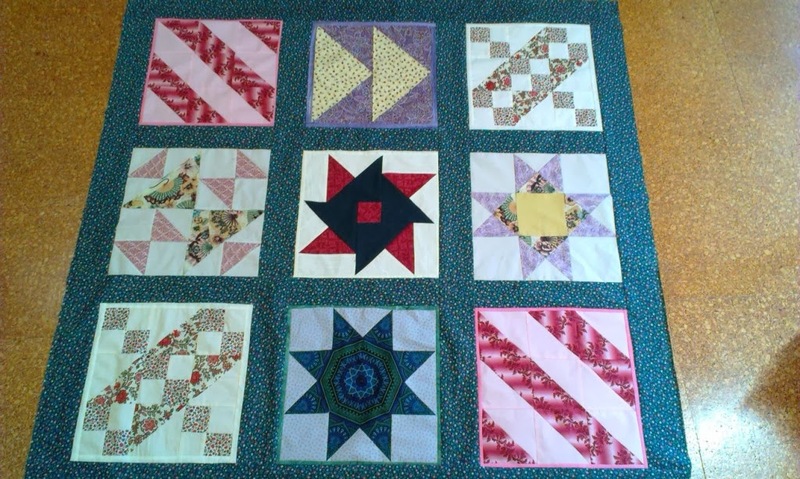 The poor darling asked me wistfully a gazillion years ago if I would make him a quilt. 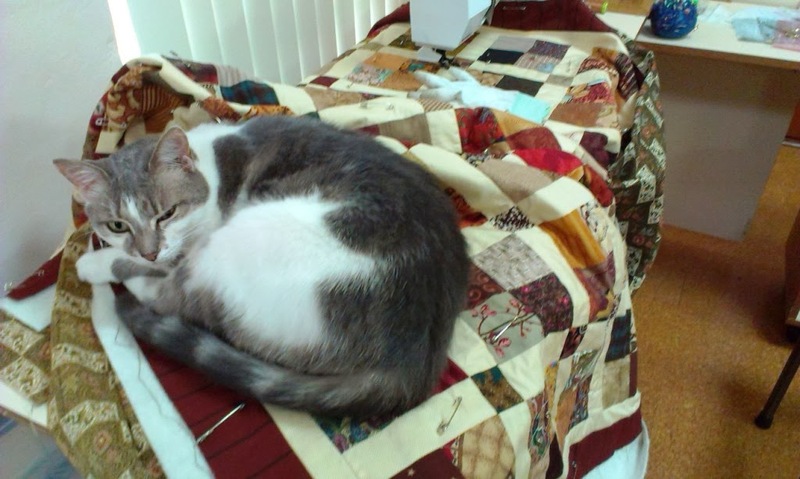 He likes orderly, old fashioned blocks, and I like to make chaotic scrappy quilts. Hence the delay in starting this. However, all is not lost. I have selected this book "15 Two-Block Quilts" by Claudia Olsen. 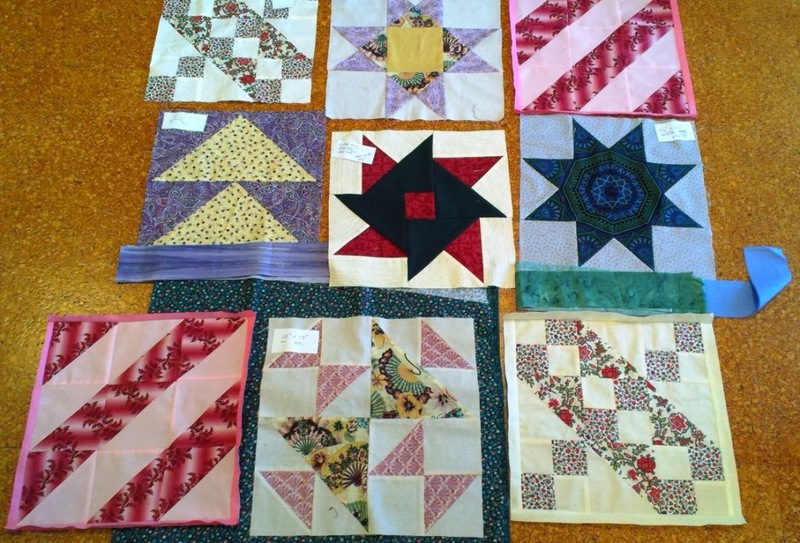 The quilt called "Fancy Corn and Beans" is a combination of two blocks - "Corn & Beans" and "Gentleman's Fancy", and the sample quilt has an interesting secondary design (as all the ones in the book do). The other pattern from the same book I like is "Shoo Box" - the blocks being "Shoo-Fly" and "Shadow Box". Both of these quilts I can make up in a more or less scrappy look (to suit me) and an orderly repeated block design (to satisfy DB). So now I am committed aren't I? Today has been the first day in a week since I had time to sit at the sewing machine and play with fabric. I've had a bad case of withdrawal symptoms I can tell you! The hectic busyness of the Christmas Season is honestly getting more and more busy as the years go on! 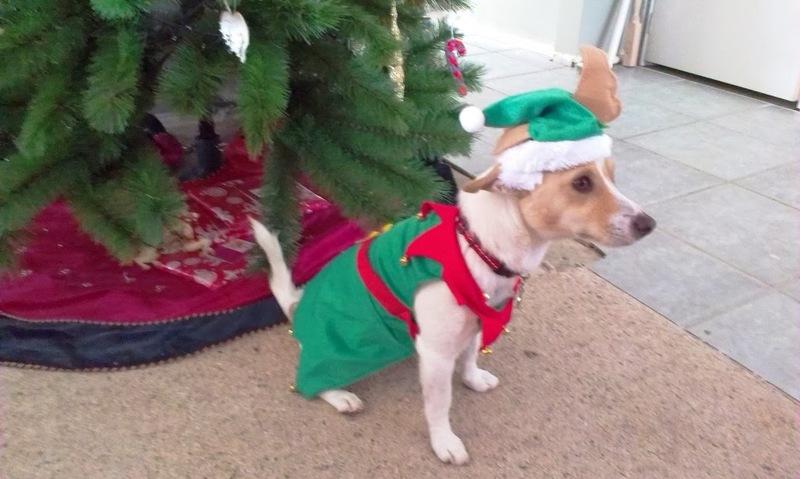 Having said that, everything I normally do during the year is finished for at least 5 weeks, and I have almost all the preparations for Christmas done. I am waiting on two gifts I've bought on-line, and I need to wrap some of the ones that are already hidden away. Organised! So what did I do today? It has been a hot and humid day, and perfect for hiding downstairs, which is the coolest part of the house. I got stuck into a school uniform for my youngest grand daughter's doll, which is a replica of the one she wears. I had to do a lot of modifications and combine two different patterns to achieve what I needed. The basic pattern for the bodice was from a tutorial here. But I needed to add a collar, drop the waist and add a faux belt to that. For the uniform I used the skirt pattern from a great tutorial here because it has the same style of pleats in it as the uniform has. Wasn't that lucky? This last pattern is terrific - it is beautifully finished and fits really well. 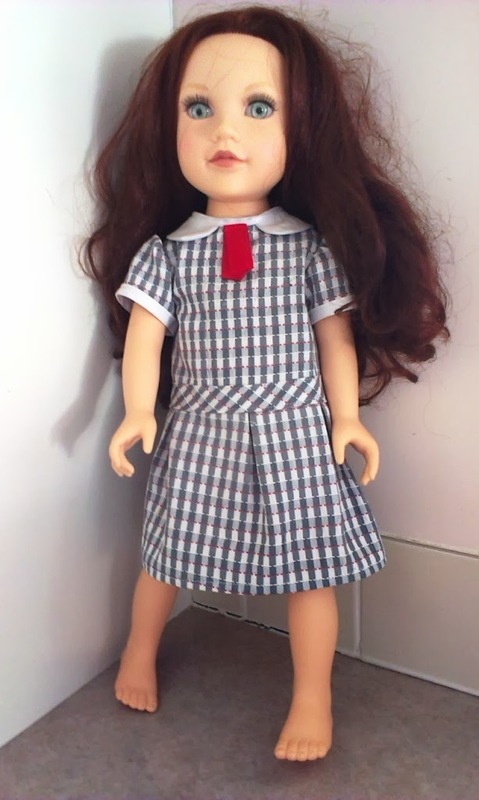 In case you were wondering, this is the same doll modelling the school uniform. I am dead pleased with the end result. I knitted a red jumper for the doll a while ago, and bought some black pumps for school shoes. 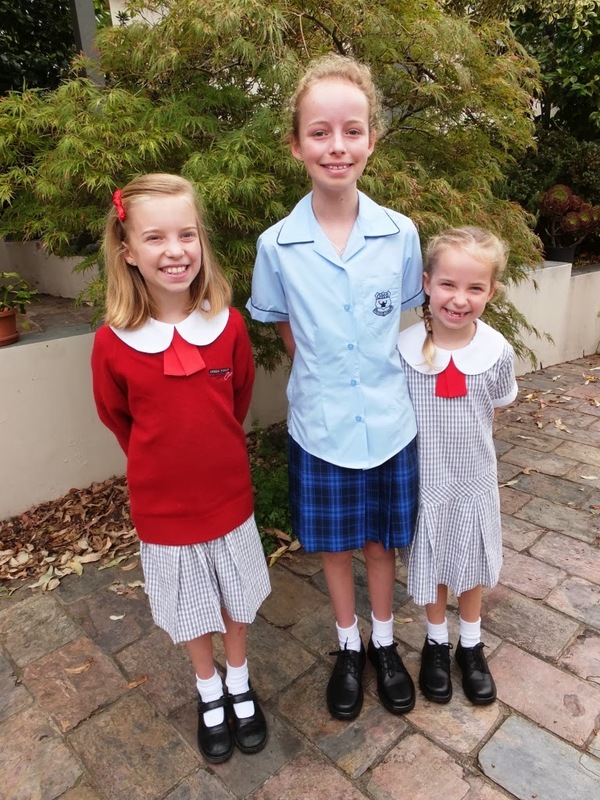 So that will complete the doll's school uniform and will be Miss 7's Christmas present. 'Til next time.....Keep on stitching. 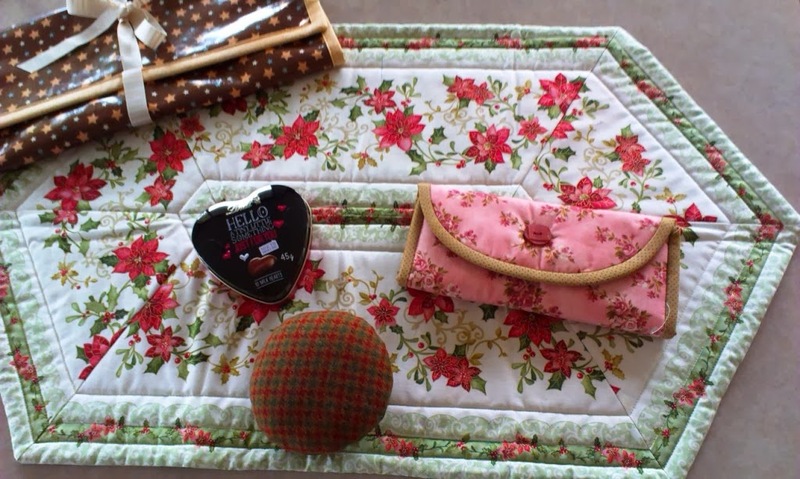 I have just linked this post up to Slow Stitching Sunday at Kathy's Quilts. We are ahead of the US timewise, so I could not do that at the time I posted this. Would be great if you went on over to take a look at some of the other links.